Little Pig is back in Little Pig Saves the Ship! When the sea-faring pigs go a-sailing! Intrepid Little Pig — still the littlest pig in the family — is too little to go to summer camp with his older brothers and sisters. He is left behind with Grandpa and Poppy. Little Pig and Poppy make and sail a toy ship all week, but on Saturday a gusty wind takes the ship into the current, and Little Pig has to use his newfound knot-tying skills to save the day. A sweetly told intergenerational story about how even the littlest can make a big difference. David Hyde Costello has worked as a scenic designer for motion pictures and the stage. He is the author/illustrator of Here They Come! (Farrar, Straus and Giroux) and I Can Help (Farrar, Straus and Giroux), and Little Pig Joins the Band. He is also the illustrator of the Ezra Jack Keats Honor Book, A Crow of His Own. He lives in Amherst, Massachusetts. ♦ Little Pig's still too small to do everything his brothers and sisters do…but it turns out that's not a problem. Little Pig's four older siblings are going to sailing camp, but Little Pig's not old enough. Eldest sibling Tiny gives him a rope to practice knots, but one whole day of tying knots is enough. Thankfully, Poppy and Grandpa come over, and Poppy brings a model ship he's carving. Little Pig helps Poppy finish the ship. They sail it on Monday and Tuesday and in the rain on Wednesday. They build a dock Thursday and sail it all the way across the river Friday. On Saturday it gets away from them and goes over a waterfall in a dramatic sequence that's perfectly gauged for the audience. Poppy can't catch it. Little Pig runs to the bridge, remembers the rope Tiny gave him, and makes use of those knots he practiced. He saves the day just in time to share sailing stories with all his siblings, home from camp. Costello's second title starring Little Pig's as charming as his earlier Little Pig Joins the Band (2011). The inviting watercolor-and-ink illustrations are a well-paced mix of full-bleed, spot, and cartoon panels dotted with speech bubbles that illuminate the close, intergenerational relationship between Little Pig and Poppy. Young listeners will identify with being too little but still quite capable. Here's hoping Little Pig will take his time growing up and gift readers with a few more tales of being smallest. ♦ The adorable protagonist of Little Pig Joins the Band returns as his brothers and sisters head off to sailing camp for the summer. Little Pig is too small to join his siblings, so his brother leaves him a book of sailors’ knots, and his grandfather carves him a miniature boat. Each day Little Pig and his grandfather sail the boat in a stream until one day it accidentally floats away. Little Pig uses his new knot-tying skills to rescue the vessel. Costello’s ink and watercolor images mixed with comic book–style word bubbles and some paneled page layouts are thoughtful and add energy and movement. The story will be a familiar one to any young reader who feels too small to join in with older siblings or peers, and offers an empowering message of learning to overcome one’s small stature. VERDICT Wholesome and cute, this fun new adventure with Little Pig is a satisfying addition to most collections. A great choice for storytime or small group sharing. Little Pig from Little Pig Joins the Band (rev. 9/11) is back, once again left behind by his older siblings. This time they are going to sailing camp without him; all Little Pig can do is stay home and practice his knot-tying skills. But then his grandfathers, Grandpa and Poppy, bring him a toy boat Poppy has carved for him, which keeps him entertained all week. Until Saturday, that is, when a gust of wind sends the little boat over a waterfall and downstream, where it will soon be lost forever. Fortunately, Little Pig's practicing comes in handy as he pulls out his rope from his pocket, ties a bowline knot, and at the last possible moment scoops the boat up. This triumph eases the sting of his siblings' return from sailing camp, as does the next adventure—a day spent sailing his beautiful toy boat with the whole Pig family. Friendly watercolors capture the hustle-and-bustle of a large family, Little Pig's initial loneliness, and summer days spent knee-deep in a (beautifully evoked) pooled-up stream, messing about with boats. A profusion of speech bubbles adds drama, immediacy, and humor (an older sister hands Little Pig a postcard upon her return and says, "By the way, I meant to mail you this"). The intergenerational friendship between Poppy and Little Pig is heartwarming, and the open-to-interpretation presentation of the grandfathers in the illustrations (it's implied that grandpa and Poppy are a couple, but not overtly stated) is just right. While his four piggy siblings go sailing, this Little Pig is stuck at home. With plenty of spare time, some bits of string and a guide to sailing knots, Little Pig is an expert knot-tier by the time Poppy arrives with a carved wooden boat. Together Little Pig and Poppy sail the boat on imaginary voyages -- with tiny wooden Poppy and Little Pig sailors onboard. When the ship heads over a waterfall, Little Pig makes a daring rescue, and he finally has a story to share with his seafaring older siblings. Adventures, after all, come in in all sizes. David Hyde Costello’s illustrations are colorful, kid-friendly and expressive. The softly painted forest and stream are especially welcoming as lovely reminders of summer days. Little Pig’s sailboat may lure readers out into the wild outdoors with homemade ships of their own. A step-by-step knot diagram will entice readers of all ages to attempt a few nautical knots, so have a shoelace or rope handy when reading. The pigs’ conversations help tell the story and add a layer of comedy, especially when Poppy finds himself going head-over-heels into the stream. 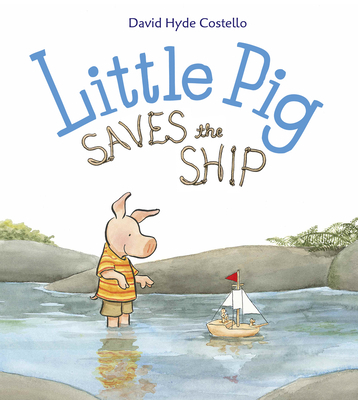 A story about family and cooperation, creativity and problem solving, Little Pig Saves the Ship is calm enough for bedtime but will stand up to multiple rereads. The relaxing vibe of a day spent wading in a stream is perfect for a summer-themed storytime.